A timeless story rediscovered by each new generation, The Diary of a Young Girl stands without peer. For both young readers and adults it continues to capture the remarkable spirit of Anne Frank, who for a time survived the worst horror the modern world has seen--and who remained triumphantly and heartbreakingly human throughout her ordeal. 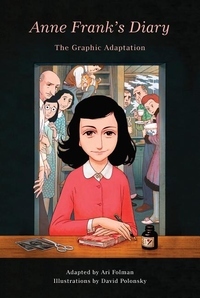 Adapted by Ari Folman, illustrated by David Polonsky, and authorized by the Anne Frank Foundation in Basel, this is the first graphic edition of The Diary and includes extensive quotation directly from the definitive edition. It remains faithful to the original, while the stunning illustrations interpret and add layers of visual meaning and immediacy to this classic work of Holocaust literature.